When Sutter Health took the risk of starting a health plan in 2014, it also faced a risk of not launching one. Sutter's 24 hospitals operate in many of the same California markets as Kaiser Permanente, the granddaddy of integrated health systems, which directs its 11.9 million HMO members almost exclusively to its 39 hospitals and thousands of Permanente physicians scattered across the state. Opening an HMO has been a costly play for Sutter. 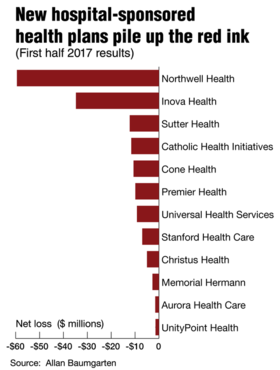 Its Sutter Health Plan lost $40.6 million in 2016 on revenue of $188.3 million. And after enrollment grew 27% in the first half of 2017 to 61,462, up from 48,284 at the end of 2016, losses for the six months totaled $12.2 million. Sutter is one of more than two-dozen hospital systems or provider groups that started health plans after 2010 when the Affordable Care Act promised millions of newly insured people to manage and serve. Almost every last one has suffered major financial losses, leading several to exit the market. The learning curve that hospital-sponsored health plans have endured is drawn in red ink. At least six have already either gone out of business or are in the process of doing so. The latter include Northwell Health's CareConnect in the New York City area and the health plans of financially troubled Catholic Health Initiatives, Englewood, Colo., and investor-owned Tenet Healthcare Corp., Dallas. Of 17 provider-sponsored health plans started since 2010, none made a profit in 2016 and just two eked out a small profit in the first half of 2017, according to a compilation by Minneapolis-based healthcare consultant and researcher Allan Baumgarten. Hospital systems that got into the health plan business after 2010 have yet to see a financial return on their investment, though several believe they are now better able to manage populations under value-based reimbursement. Contrast that with a decades-old player such as Kaiser, which has a 95% retention rate of members and posted first-quarter 2017 operating income of $1 billion. Sutter's losses were not entirely unexpected, and there have been benefits if not financial ones. The plan and parent are learning the intricacies of managing large populations, opening walk-in retail clinics to better serve patients in lower-cost settings and taking on Kaiser for members, especially in Northern California, said Phil Jackson, CEO of Sutter's Health Plan Products. "There's a learning curve associated with a new plan," he said. Still, the losses are proving to be too much for some. Northwell, a 21-hospital system based in Long Island, has been the biggest loser among the newcomers to the space. The system last month announced it is closing its 4-year-old CareConnect health plan after losing $157.8 million in 2016 and another $59.9 million in the first half of 2017. The $157.8 million loss was a whopping 44% of the insurance operation's total revenue of $360.8 million. Other notable losers were Innovation Health Insurance, a Falls Church, Va.-based plan that lost $26 million in 2016 and $32.9 million in the first half of 2017, as well as Memorial Hermann Health Insurance of Houston, which lost $15 million in 2016. Innovation Health is a joint venture between Aetna and five-hospital Inova, which operates in the suburbs of Washington, D.C.
A main culprit in the losses at both CareConnect and Innovation Health are risk-adjustment penalties the CMS collects from health plans that enroll healthier people from the marketplace exchanges and small employers compared with their counterparts. Risk-adjustment payments under the program cost CareConnect $112 million last year for its small-group block of business and $20 million for individuals, said Richard Miller, Northwell deputy chief financial officer of business strategy. CareConnect, even though it is being wound down, will lose another $100 million in each of 2017 and 2018, in large part because of risk-adjustment obligations from the previous years, he said. It's the same problem at Innovation Health. The plan and its sister HMO, Innovation Health Plan, had to make risk-adjustment payments between them of $52 million in the first half of 2017 to compensate for having a rela-tively healthy population of enrollees in 2016, said Russ Mohawk, Inova senior vice president and CEO of Inova Health Plans & Population Health Services.The risk-adjustment provision was put into the ACA to keep insurers from cherry-picking healthy individuals and small groups for coverage. It requires plans that enrolled healthy patients to pay a penalty for meting out less care so that the penalty funds can be redistributed to plans with sicker patients. It is supposed to be revenue-neutral from that standpoint. But Miller said as a new health plan established in 2014, Northwell's CareConnect could not know the health status of the vast majority of its new members, which now number about 118,000. It often takes months for a new patient to first make contact with a provider and, even then, it may take more than one visit to determine the state of the patient's health and properly code the conditions at the provider and insurance levels, he said. It turned out that CareConnect's membership was far healthier than some of its competitors. And because of fast growth and a lag in knowing exactly what the risk adjustment would be, CareConnect could not raise premiums fast enough to cover its losses, Miller said. Northwell got into the health plan business originally to diversify its revenue and profit beyond providing care as well as to learn to better manage its patient population, Miller said. At least from a population management standpoint, Northwell has benefited, he said. When Northwell started the health plan in 2014, it cared for about 120,000 lives under some kind of value-based contract that put the system at some risk for the cost and quality of care. Today, that number is 400,000, he said. Starting an insurance business is a risky way for hospital systems to learn about population management, said Joseph Damore, vice president of Population Health Management at Premier, a Charlotte, N.C.-based healthcare group purchasing and consulting company. He said that new health plans can end up enrolling patients who would normally come to the parent's hospitals and physicians at prices lower than what they would have gotten in fee-for-service or even under value-based contracts. That's especially true as these newcomers price their products to compete against established national insurers. Starting a health plan makes sense if the purpose is to manage Medicare and Medicaid patients whose reimbursement already is often below cost, Damore said. Cone Health, a six-hospital system in Greensboro, N.C., established a Medicare Advantage plan in 2016 through a joint venture with Care N' Care Insurance Co. in Fort Worth, Texas. Cone launched HealthTeam Advantage, because competing plans were moving out of the area and the health system already had a strong accountable care organization that now has 3,500 providers, said Brendan Hodges, executive director of HealthTeam Advantage. The plan has filled a community need and is expected to eventually help diversify Cone's income stream, he said. Its losses were among the lowest of the health plans Baumgarten reviewed. It lost $3.6 million in 2016 on revenue of $56.8 million. But losses widened in the first half to $10.6 million as membership doubled to 12,048 through June 30, from 6,738 at year end. Hodges said Cone launched the plan with the expectation that, as a startup, it would take three to five years to become profitable. Innovation Health, which was started in 2013, made money in 2014 and 2015 before big risk-adjustment payments threw the plan into the red in 2016. In May, Innovation announced that it is exiting the exchange marketplace in Virginia by year-end because of its losses among 68,000 individual members, Inova's Mohawk said. Individual membership more than doubled between 2014 and today, he said. Inova entered the insurance business with Aetna expecting the ACA to drive payment away from fee-for-service to value-based reimbursement, Mohawk said. And the system feels comfortable that the plan is helping the system accomplish that, he said. Sutter's health plan is hastening that transition as well. To offer more convenience to members and Sutter Health patients, the system has opened six walk-in clinics, which offer same-day visits and are the same cost as a primary-care visit. Sutter Health plans to add two more sites this fall. The network for Sutter Health Plan's 67,000 current members now includes 28 Sutter hospitals, 45 urgent-care centers and more than 5,000 doctors in 14 Northern California counties where Kaiser dominates in managed care. Not-for-profit Kaiser is the nation's largest integrated health system with revenue of about $71 billion. Fueled by 8.4 million HMO members in California alone, Kaiser posted operating income in the first half of $1.8 billion. "We're bringing more choice and value," Jackson said. "There's a lot of risk but potentially big rewards."